Designer clothes can be an expensive purchase, and over time as your wardrobe is built up, the cost of replacing your wardrobe increases. 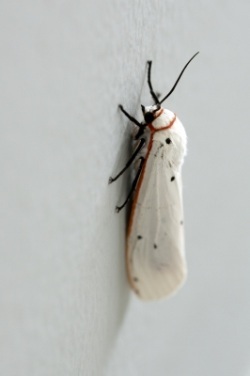 Many people do not realize that it is not the actual fabric of your wardrobe that attracts moths, but rather the proteins in spilled food and perspiration which provide the moths with an appealing place to lay its eggs. It's the actual larvae that to do the damage to your clothes, eating the natural fibers of wool or cotton along with the proteins. Because more expensive clothes tend to be dry clean only, and are therefore more likely to be put away in the wardrobe when they really should be taken to the dry cleaners, its likely to be the best clothes in your collection that get eaten first! Months don’t really have a preference for Prada or Gucci, and if your clothes are dry cleaned after every use, the risk of moth infestation is greatly reduced. Cedar balls are also an effective deterrent, months hate the smell of cedar and although there are chemical alternatives to cedar moth balls on the market, they are somewhat undesirable due to the effectiveness of this natural and eco friendly option. How you go about treating a stain on a dry clean only garment really depends on the type of stain, however, its important that you do not scrub at the stain regardless of it's type. Aggressive scrubbing can damage the fibers of the cloth and lead to piling or scuffing which is irreversible. Instead gently dab at the stain with a damp cloth, then take the garment to your dry cleaners for professional spot treatment as soon as possible. The longer you leave it, the less likely the stain will be successfully removed.